The NCDA intensifies its advocacy to make the “Regional Committees on Disability Affairs (RCDA)” functional as a channel of convergence on disability to “Make the Rights of Persons with Disabilities Real” at the regional level. 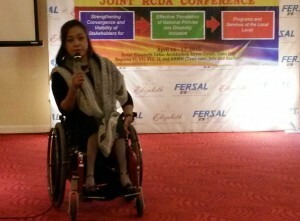 The RCDAs are chaired by the Department of Social Welfare and Development (DSWD), with the regional offices of frontline agencies mandated to promote, protect and ensure the full and equal opportunities of persons with disabilities, as well as leaders of disabled people’s organizations (DPOs) as members. In the recently concluded Joint RCDA Conferences held on March 25-26, 2015 in Marco Polo Hotel, Davao City for RCDA X, XI, XII, CARAGA and part of ARMM, and on April 16-17, 2015 in Hotel Elizabeth, Cebu City for RCDA VI, VII, VIII, IX and part of ARMM, the said RCDAs reported their respective accomplishments. The groups also came up with their respective regional plan of action for persons with disabilities for 2016. The presentation of the resource persons from the head offices of DOTC, DSWD and DILG as well as those provided by the Regional offices of DOH, DOLE, DPWH and DBM was one of the highlights of the conference. They shared their major accomplishments in 2014 and showed the participants the direction their agencies are heading in 2016. Also, Ms. Adela A. Kono of ORA highlighted in her presentation their efforts on advocating accessible tourism at the local level which led to the passage of a local ordinance requiring hotels, restaurants, resorts and amusement centers to incorporate accessibility features in their establishments with emphasis on adhering to the concept of “universal design”. NCDA Acting Executive Director Carmen R. Zubiaga capped the conferences with an urgent call for the need to translate national disability policies into concrete disability inclusive programs and services at the local level through institutionalizing coordination among NGAs’ regional field offices, local government units and alliances with non-government organizations most especially with DPOs in the region. Both conferences were supported by DSWD Field Offices. NCDA’s Acting Director Zubiaga gave special recognition to Director Prescilla Nidea-Razon and Director Mercedita P. Jabagat of Field Offices XI and VII respectively. World Health Organization (WHO) also provided the necessary support for the conduct of the Joint Conferences. Dr. Mylene Rose Benigno represented the organization during the conference. establishment of PDAO in every local municipality/cities should be given priority in order to promote programs and projects on disability in the local level.